Prof Paul Schimmel received his PhD in Biophysical Chemistry from Massachusetts Institute of Technology (MIT) in 1966. Before he joined the Scripps Research Institute in 1997, he was the John D. and Catherine T. MacArthur Professor of Biochemistry and Biophysics in the Department of Biology at MIT. Currently, he is the Ernest and Jean Hahn Professor of Molecular Biology and Chemistry at The Skaggs Institute for Chemical Biology of the Scripps Research Institute. His major research activities have concentrated on the decoding of genetic information, with emphasis on the rules of the universal genetic code which are established through aminoacylation reactions catalyzed by a group of enzymes known as aminoacyl tRNA synthetases. The latter are believed by many to be among the first enzymes to arise on this planet in the early stages of the evolution of life. His research group’s recent works include the development of ATYR1923, a clinical-stage product candidate which binds to the neuropilin-2 receptor and is designed to down-regulate immune engagement in interstitial lung diseases and other immune-mediated diseases. Having a longstanding interest in the applications of basic biomedical research to human health, Prof Schimmel is a Member of the US Academy of Sciences, the American Academy of Arts and Sciences, the American Philosophical Society, the US National Academy of Medicine and the US Academy of Inventors. 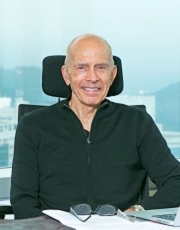 He holds numerous patents and is a cofounder or founding director of multiple biotechnology companies, of which seven became publicly traded on NASDAQ. These companies are developing new therapies for human diseases and disorders, one of which, Pangu, is a joint venture with HKUST.